The Notre Dame vs USC game was a classic example of how wrong preseason predictions can be. The Notre Dame Fighting Irish looked to have issues prior to the season. Quarterback Tommy Rees was suspended for the first game of the year due to an alcohol related arrest at an off-campus party. On top of that, running back Cierre Wood was suspended the first two games for a violation of team rules. Many of the so-called experts also pointed to a difficult schedule. With all of these issues, many analysts predicted a .500 season for the Irish. Redshirt freshman Everett Golson came out of fall camp as the starting quarterback. Even though he was the starter for the first game, it was not clear if he would just start the first game or if he was truly the starting quarterback. The Irish traveled to Dublin, Ireland for their first game against the United States Naval Academy. The Irish leaned on their defense and the running game to easily win 50-10. Golson did just enough to win, not taking any chances and just managed the game. The following week, the Irish played Purdue and trailed late in the game. Coach Brian Kelly pulled Golson and brought in Rees from the bench. Rees led the Irish from behind in a 2:00 drill to get the win and open up a quarterback controversy. Kelly stuck with Golson, opting to bring in Rees off the bench as needed. In week 4, against Michigan, Rees again came off the bench to lead the team to a 13-6 win. In week 7, against Stanford, Golson was injured late in the game and Rees again bailed them out with a 20-13 overtime victory. It was determined later that Golson had a concussion and he was held out of the BYU game even though he had been cleared to play. Rees led the team to a 17-14 win. Perhaps the turning point of the season came when the Irish traveled to Norman, Oklahoma to face the Sooners. Very few people gave them a chance to win. After sitting out a week, Golson was again under center. The Irish were leading 13-6 into the 4th quarter, but Sooners tied the game at 13-13. At this point, Kelly took the reins off of Golson and he completed a 50 yard pass to Chris Brown to setup the Irish to take the lead on a 1 yard run by Golson. The Irish never looked back and upset the Sooners 30-13. Neither quarterback was effective for the Irish in the following game against Pittsburgh. It looked like the Irish had a letdown from the Sooner win as they trailed 20-6 going into the 4th quarter, but then Golson got hot and led his team to 14 straight points to send the game to overtime and they eventually won a triple overtime thriller 29-26. After easy wins against Boston College and Wake Forest, the Cardiac Irish went into this game needing only a win to have a chance at winning a national championship. Golson has grown up quite a bit this season. He has gone from a game manager to a quarterback that can attack a defense with either his arm or his legs. He still has a lot of learning to do, but his talent is unmistakable and he gets better with each and every start. The USC Trojans are on the exact opposite end of the spectrum. The Trojans had a highly regarded quarterback that passed on the 2012 NFL draft and returned for his senior season. Matt Barkley was expected to be a candidate for the Heisman Trophy this year. To go with Barkley, the Trojans have probably the best receiver duo in the country, in Robert Woods and Marquise Lee. In the fall, they also added running back Silas Redd who had rushed for over 1,200 yards for Penn State last season. The Trojans were a trendy pick in many circles to challenge the SEC and contend for a national championship. Things started out well for the Trojans, winning the first two games by blowout margins. In week 3, however, the Trojans faced Stanford and the Cardinal defense shut down Barkley and the Trojans, beating them 21-14. Since the Stanford loss, the Trojans only won 5 of the next 8 games going into the Notre Dame game. The USC offense put up big numbers, but they were unable to stop teams from scoring, ranked only 46th in the country in defense. In this game, the Irish came out attacking early and scored on their first two possessions, taking a 10-0 lead. USC, playing without Matt Barkley, had to start freshman quarterback Max Wittek. Wittek, playing in his first game struggled early, but early in the 2nd quarter, got into a rhythm and completed an 11 yard touchdown to Robert Woods to cut the lead to 10-7. Notre Dame continued to move the ball well, but had to settle for field goals rather than touchdowns. The score at the half was Notre Dame 16 USC 10. On the Trojan’s first possession of the 2nd half, Notre Dame linebacker Manti Te’o intercepted Wittek to give the Irish the ball in Trojan territory. The pick was his 7th of the year and leads all FBS linebackers. The Trojans dodged a bullet though, as the Irish missed a 34 yard field goal. Near the end of the 3rd quarter, Notre Dame scored on a 33 yard field goal to give them a two score lead at 19-10. USC answered on their next possession, getting a 21 yard field goal to cut the Irish lead to 19-13. Notre Dame responded, once again making it a 9 point lead with a 19 yard field goal to push their lead out to 22-13. Down by 9, with 5:58 to go, Marquise Lee quickly gave USC hope. First, he returned the kickoff 43 yards to give his team the ball at their own 45 yard line. On the next play, Wittek hit Lee for 53 yards to put them at the Irish 2 yard line. The play was a perfect example of why the USC coaching staff is exciting about the potential of Wittek and his big arm. After consecutive pass interference penalties on Notre Dame corner KeiVarae Russell put the Trojans at the 1 yard line, they ran 4 straight plays without gaining a yard. The Trojans essentially ran 6 plays from inside the Notre Dame 4 and could not find the end zone and they wasted valuable time off the clock. After taking over the ball, Notre Dame was able to run 2:14 off the clock and gave USC only one shot with the ball and 0:19 to work with. Linebacker Prince Shembo and defensive end Kapron Lewis-Moore combined to sack Wittek on the last play of the game and Notre Dame had clinched a shot at a national title. Notre Dame has been an underdog all season and despite their #1 ranking, may be the underdog again in the BCS National Championship Game, but this team does not seem to care. They have responded all season to adversity and I look for them to do the same against the SEC champion. Cierre Wood-RB-Sr: Cierre Wood’s workload has been much less this year. The Irish moved Theo Riddick from wide receiver to running back to cover Wood’s suspension and Riddick has become the lead back. After rushing for over 1,100 yards in 2011, Wood only has 740 yards rushing this season. I still believe NFL teams will be interested in him in April. He runs well between the tackles and has the speed to bounce it outside. He also makes plays in the passing game. I believe he has the versatility that NFL teams look for in a running back. Against USC he had 8 carries for 20 yards and 2 receptions for 18 yards. Theo Riddick-RB-Sr: The more I watch Theo Riddick, the more I like him. Riddick played wide receiver last year, but was shifted to running back this year. Most receivers shy away from contact, but Riddick seems to thrive on it. He has an ability to dart through small creases and gash a defense. Riddick doesn’t mind taking on a tackler and he keeps his legs churning after contact. He has great vision which helps him to find soft spots in the defense and he can spin out of tackles. Since he is a former receiver, he also makes plays in the passing game and has a good vertical jump which allows him to snag high balls. Against the Trojans he carried the offense with 20 carries for 146 yards and 1 touchdown. He also had 3 catches for 33 yards. T.J. Jones-WR-Jr: T.J. Jones is Notre Dame’s #2 receiver, but he has only one less catch than Tyler Eifert. Jones has developed good chemistry with Golson. While he is only 5’11”, his vertical jump allows him to play much bigger. Against USC he had 3 catches for 40 yards. Robby Toma-WR-Sr: Tobby Toma is a small, quick receiver that makes his living in the slot. He makes the underneath catches and moves the chains. Despite his size, he is a good blocker. He has good hands and stays with the catch. Against the Trojans he had 2 catches for 34 yards. John Goodman-WR-Sr: John Goodman is a former quarterback and was Tyler Eifert’s high school quarterback. He moved to receiver when he enrolled at Notre Dame. Since he is a former quarterback, he has good size which he uses to his advantage as a receiver. Goodman has mostly been a backup receiver and punt returner, but he has made more of an impact as this season wore on. Against USC he had 1 catch for 23 yards. Tyler Eifert-TE-Sr: Tyler Eifert has fewer receptions since Golson took over at quarterback, but the catches he makes are important catches. Roughly 2/3 of his catches are for first downs or touchdowns. While Eifert does lead the team with receptions, he has gone from 80 catches in 2011 to 44 this season. He is a dependable receiver that Golson looks for when they need a big play. Eifert does a good job coming back to the ball to make the catch and he is tough to bring down once he has the ball in his hands. He was led the Irish 4 catches for 59 yards against USC. Mike Golic Jr-G-Sr: I look for Mike Golic Jr to be a middle round selection in next year’s draft. He has good mobility which allows him to trap and seal defenders, making the Irish ground game go. Being the son of former Eagle defensive tackle and current ESPN broadcaster Mike Golic won’t hurt his chances. Kapron Lewis-Moore-DE-Sr: Kapron Lewis-Moore is a lunch pail type player for the Irish defensive line. He just gets the job done. Lewis-Moore can play the 5 technique in a 3-4 defense or he can slide inside to defensive tackle. He has good quickness and balance. He gives good effort and has the ability to shed blockers and stack up the running game. Against the Trojans he had 5 tackles, 2 tackles for loss, 1 ½ sacks and forced a fumble. Louis Nix III-NT-Jr: Louis Nix III is a massive nose tackle that ties up the middle of the line. He has a good swim move and gets off of blockers well. On passing downs he has the ability to push the pocket and he gets his hands up if he can’t get to the quarterback. Against USC he had 3 tackles, a tackle for loss on 3rd down and a batted pass in the red zone. Prince Shembo-OLB-Jr: Prince Shembo is a big, explosive linebacker in his second season as a starter. He has the size to move to defensive end in passing situations. The Irish like to put him into situations where they can utilize his pass rush ability. He is second on the team in sacks behind Stephon Tuitt. Against the Trojans he had 5 tackles and ½ tackle for loss. Shembo and Lewis-Moore combined on a sack of Wittek to end the game. 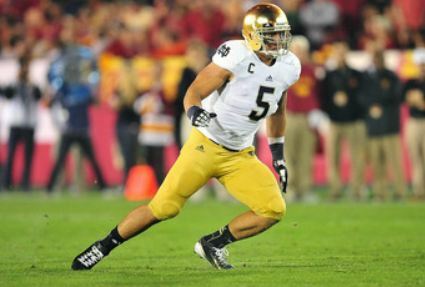 Manti Te’o-ILB-Sr: Manti Te’o is not only the heart and soul of the Irish defense, but of the entire team. Te’o is a fiery leader that gets his entire team to play at an entirely different level. His 7 interceptions lead FBS linebackers. He has a very real chance of being the first defensive player since Charles Woodson in 1997 to win the Heisman Trophy. Woodson had one advantage over Te’o in that he returned punts. Te’o has an effect on every aspect of the defensive game plan. He is a heady player that makes plays against the run or the pass. He does a good job in zone drops, knowing where the throwing lanes are and getting into them to disrupt the play. Te’o is also a tackling machine, leading Notre Dame in tackles the last three years. Against USC he had 6 tackles and a pass break up in the end zone. On his pass breakup he was actually covering receiver Marquise Lee. Zeke Motta-S-Sr: Zeke Motta is a former linebacker that was moved to safety his freshman season. He is an experienced defender that has never missed a game in his career at Notre Dame. Motta is a good blitzer and he plays the run very well. Against the Trojans he had 5 tackles and 1 tackle for loss in the red zone. Matt Barkley-QB-Sr: Matt Barkley had to sit this game out due to an injured shoulder. It is believed that he will be able to play in the Trojans bowl game, assuming they go to one. This has been a rough year for Barkley. He passed up a chance at the 2012 NFL Draft to come back to USC and possibly lead them to a national title. That hasn’t work out. Although he has had a good year, you have to wonder if the scrutiny of this year will affect where he is selected in the draft. Before the season he was believed to be the #1 overall pick and he was the #1 ranked quarterback in my preseason rankings. Many people are saying this is a weak draft for quarterbacks and that a defensive player will be picked with the first pick. One thing is sure. The opinions will change many times between now and April. Curtis McNeal-RB-Sr: Curtis McNeal is a small, quick running back with great feet. He has fantastic vision and cutback ability. McNeal was effective early against Notre Dame, but the Irish made adjustments and held him to only 38 yards rushing on 9 carries. Silas Redd-RB-Jr: After rushing for over 1,200 yards for Penn State, Redd transferred to USC but has had a somewhat disappointing season. He leads the Trojans in rushing but only has a little over 800 yards. Redd has battled injuries this year and has not gotten to carry the load that many people thought he would. He missed the Arizona State game due to injury and only had 3 carries against UCLA, but he looked fresh in this game. Against the Irish, he had 77 yards rushing on 12 carries and showed better acceleration and determination than in previous games. Robert Woods-WR-Jr: Robert Woods had a fantastic 2011 season, but this year he has been overshadowed somewhat by Marquise Lee. It looked like the Irish went into the game determined to shutdown Lee and Woods took advantage of that strategy. Woods meshed well, particularly early with the young QB, catching 7 balls for 92 yards and 1 touchdown. If Woods declares for the NFL draft, he should be a high pick. He has good speed and runs great routes. Woods has very good size which allows him to catch the ball at its highest point. He has very good body control and is willing to go over the middle and take hits. Woods was my #1 ranked draft eligible wide receiver in the preseason and I still believe he will be the first receiver taken. Khaled Homes-C-Sr: Khaled Holmes was my #2 ranked draft eligible center in the preseason. Holmes was injured early in the year and missed some time. He still looks like he isn’t completely 100% recovered from the injury. He did a good job run blocking, but struggled at times on inside pass protection. John Martinez-G-Jr: John Martinez is a mobile guard that does a good job pulling and leading the sweep. He has the speed to get downfield and make blocks against the secondary. Morgan Breslin-DE-Jr. Morgan Breslin is a first year starter that has become the Trojans best pass rusher and leads the team in sacks. He gets off the ball well and chases the ball parallel to the line of scrimmage. Against Notre Dame he had 4 tackles, ½ tackle for loss and ½ sack. Dion Bailey-OLB-RS Soph: Dion Baily is a very fast linebacker. He is a former safety that was moved to linebacker to get more speed on the field. He reads his keys well and chases down the ball carrier. Being a former safety, he does a good job in the passing game, dropping deep into coverage and getting into passing lanes. Bailey does a good job reading the quarterback’s eyes then making plays on the ball. Against the Irish he had 4 tackles and 2 passes broken up. Jawanza Starling-S-Sr: Jawanza Starling is an experienced player that is in his third year as a starter at safety. He does a good job playing the box and is a very sure tackler. Against Notre Dame he had 8 tackles and stopped Everett Golson short of the end zone. This entry was posted on November 27, 2012 by draftmaniacs in Scouting reports and tagged Mani Te'o, Notre Dame football, USC football.